Featuring architecture by some of the biggest Mid-Century names, including Mies van der Rohe, Marcel Breuer, Eero Saarinen, and Philip Johnson, each of the more than 250 buildings is located on a regional map. The book includes all the additional information needed to find and visit each building. Including icons from The Met Breuer to the fabulous beach houses of Fire Island, private homes in Connecticut, Manhattan skyscrapers, and the Tropical Modern residences of Sarasota, Florida, it is a must-have guide to one of the most fertile and lesser-known regions for the development of Mid-Century Modern architecture. From the publisher of Mid-Century Modern Architecture Travel Guide: West Coast USA. 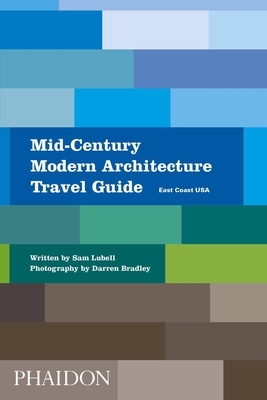 Sam Lubell has written eight books about architecture, including California Captured and Mid-Century Modern Architecture Travel Guide: West Coast USA, both from Phaidon. He is a Contributing Editor at The Architect?s Newspaper and writes for The New York Times, Wallpaper, Dwell, Wired, The Los Angeles Times, The Atlantic, Architectural Record, Architect Magazine, Contract, Architectural Review and other publications. Darren Bradley is a Southern California-based architectural photographer, active in the preservation of Mid-Century Modern architecture.